From Meredith to Mommy: Mom or Maid? Last night, I decided we were going to have a family meeting this morning. Adam and I love the Blue Collar Comedy Tour shows, and I'm pretty sure it was Bill Engvall who referred to these "Come to Jesus" meetings, and how his wife would call them when she was, shall we say, beyond done with a certain situation. I was beyond done last night. Typically, after the girls are tucked into their beds, I will spend a few hours writing, reading, social media-ing, and doing all the blog stuff that I can't do when the girls are awake. I love this time. I love writing, I love reading, and I love that this is time to work on my stuff. I spend naptime doing household chores, and evening is for me to unwind and do something for myself. Yes, it is also for Adam and I to spend time together. Don't worry, we get plenty of "couple time". Thanks, though. Now a few months ago, this wasn't a problem. Because we had our evening routine down to a science. At 5, Adam would take a break and come downstairs to play with the girls while I cooked dinner. We'd eat around 5:30. He'd keep playing with them until 6:00 while I did some kitchen cleanup. Then I'd take Reagan upstairs while he and Madison cleaned up toys, and after the toys were put away, they'd come upstairs for some play in Madison's room before it was time for her bath and bed. We'd put Madison to bed together, and by 7:30 or 8, the evening was ours. Adam took care of any kitchen clean up that was leftover before he came upstairs for the night. Great, right? Daddy playtime, sharing responsibility for getting the house back in order, helping Madison learn to clean up her toys, a tidy kitchen, preparation for a fresh start in the morning, and time to relax. Adam had some projects at work that took over his evenings. His company is small, and focused on growing. He was still able to eat dinner with us, still able to put Madison to bed, but instead of playing, he was sitting in his chair writing proposals. Instead of cleaning up with Madison, he was answering emails while she continued to play around him. And after Madison was in bed, he was right back to the grind, on the phone with his partner, planning strategy. Obviously, I understand this. It's a small company, so there are many things that simply won't get done if he isn't doing them. And I have a vested interest in this company doing well. It's not a big corporation, where there's a safety net. But somehow, we'd gotten into the habit where I was putting Reagan to bed with Madison close behind, leaving the mess downstairs. I didn't want to give up my time once they were asleep, Adam was working until 11 at night, and we were getting the basics done, and trying to catch up in the morning. Last night I'd had enough. I'd spent some time on my computer, but when Adam came up, I was looking forward to taking a relaxing bath, and maybe even getting to bed early (or watching DVR'd TV). He was exhausted and crashing into bed as the tub was running, and I asked him if he'd set the dishwasher before coming up. He said he hadn't. I wasn't worried. I'd cleaned up all the cooking dishes before bringing Reagan upstairs, and there hadn't been many toys out, so I figured I'd pop down after my bath, set the dishwasher, and come right back up. Somehow, the kitchen and living room had sprouted huge messes since 6:30. The floor was covered with little toys, the counter was full of dishes, and there was no way I could let this go. It was horrid. So I cleaned. For an hour. And while I cleaned, I planned our "Come to Jesus" meeting. Last time Madison saw me cleaning the kitchen floor, she told me I was "just like Cinderella"
Thesis: Mommy should not be the only one cleaning in the evenings. I realize that by staying home, the bulk of the "home" chores fall to me. I get that. I'm truly ok with that. 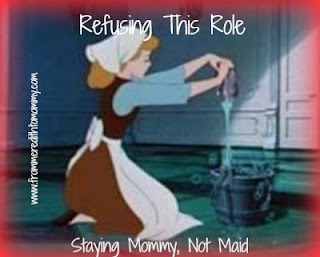 However, I'm still a family member, not a housekeeper. As I was gathering up toys and dishes and wiping down counters, I realized that by letting this go as long as we had, we were teaching Madison that it's ok if you don't clean up your toys. Someone else will do it. By letting things go, I was giving the impression that I was ok with a messy kitchen, as long as it was kept at bay. And if I decided to give up my evenings so that I could just get it all done, I was giving the impression that what I was doing wasn't important to me. And I wasn't ok with any of those things. Now, I wasn't annoyed enough to wake Adam up at 11:30 at night to tell him I wanted him to clean the kitchen. But this morning, as we ate breakfast as a family, we had our meeting. Mommy aired her grievances, she was acknowledged and validated, and a plan was put into place. We'd let a few busy nights slide into a habit, and we talked about the longer than it was allowed to go on, the harder it would be to break. Adam's coworkers and customers are now accustomed to reaching him in the early evenings. Madison seems surprised whenever she's asked to pick up a toy. Things need to change and we developed a tentative plan. We decided to put the new plan into effect tonight. Adam is "on vacation" this week (yes, those quotes are both accurate and intentional) so in theory, we could set up a new routine without any last minute customer calls or proposals to get out. We have evenings that Adam is out, and evenings that I'm out, so we can attempt to figure out all the variables. Time will tell if the plan actually works. I'm holding off on sharing the details until we get the kinks worked out, but I'm hopeful that we'll find a good balance. But unless I get my evenings at the ball and a major wardrobe upgrade, I'm refusing the Cinderella role. And that feels good.